YouTube TV is officially happening. 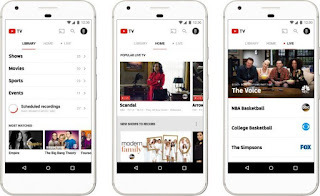 Google (GOOG, GOOGL) on Wednesday announced that the world’s largest video sharing website is getting a live TV streaming service that will let you watch 40 channels at launch, including the five major broadcast stations, with more coming in the future. The $35 per month service, which launches in New York, Los Angeles, San Francisco Bay Area, Chicago and Philadelphia with other regions to follow, will let you stream ABC, CBS, FOX, NBC and the CW. That’s a coup for Google, as competing services like Dish’s (DISH)Sling TV and Sony’s (SNE) PlayStation Vue either offer only some of or none of those broadcasters. Outside of those channels, you’ll get Fox Sports and its FS1 and FS2 affiliates, ESPN and its various offshoots, CBS and NBC’s sports channels … you know what, let’s just say there are a bunch of sports networks. There’s also Syfy, Bravo, FX and FXX, E, Disney Channel, Fox News, MSNBC and CNBC and a slew of others. Google says it’s also adding AMC, BBC America, IFC, Sundance, We tv and BBC World News in the near future. You’ll also have the option to add on Showtime and other channels for an added fee. You’ll get access to YouTube Red Originals as part of the standard package. Interestingly, Google doesn’t make any mention of adding HBO to the mix. YouTube TV will include six user accounts, as well as a cloud-based DVR with unlimited storage. Which means you can save every episode of “Big Bang Theory” for when you have guests over and want a not-so-subtle way of chasing them out at the end of the night. Naturally, you’ll be able to stream YouTube TV through your browser on your desktop or laptop, as well as your smartphone or tablet. Google is also throwing in a free Chromecast after your first monthly payment, so you’ll be able to stream your shows to your big-screen TV when you want to relax on the couch and not have to hold your phone or laptop. With its $35 price tag, Google immediately undercuts Sony’s PlayStation Vue, which starts at $39 per month. Sony’s offering, however, gets you more than 45 channels for that extra $4. Sling TV, meanwhile, starts at $20 per month for 30 channels, but gives you 45 if you jump to the $25 option. Still, with its brand recognition and Google’s massive reach, YouTube TV could put a hurting on Vue and Sling TV. Naturally, I’m taking it upon myself to test YouTube TV for you, dear reader, by locking myself in an office for the rest of the day and watching TV. The sacrifices I make for you people.